We introduce the concept of topic modelling and explain two methods: Latent Dirichlet Allocation and TextRank. The techniques are ingenious in how they work – try them yourself. What is Topic Modeling? Why do we need it? Large amounts of data are collected everyday. As more information becomes available, it becomes difficult to access what we are looking for. So, we need tools and techniques to organize, search and understand vast quantities of information. Topic modelling can be described as a method for finding a group of words (i.e topic) from a collection of documents that best represents the information in the collection. It can also be thought of as a form of text mining – a way to obtain recurring patterns of words in textual material. There are many techniques that are used to obtain topic models. 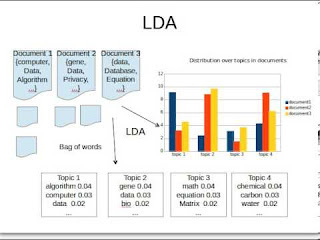 This post aims to explain the Latent Dirichlet Allocation (LDA): a widely used topic modelling technique and the TextRank process: a graph-based algorithm to extract relevant key phrases. 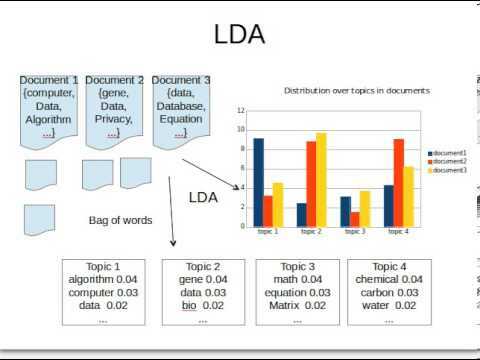 In the LDA model, each document is viewed as a mixture of topics that are present in the corpus. The model proposes that each word in the document is attributable to one of the document’s topics. Document 1: I had a peanut butter sandwich for breakfast. Document 2: I like to eat almonds, peanuts and walnuts. Document 3: My neighbor got a little dog yesterday. Document 4: Cats and dogs are mortal enemies. Document 5: You mustn’t feed peanuts to your dog. So, how does LDA perform this process? On repeating the last step a large number of times, we reach a steady state where topic assignments are pretty good. These assignments are then used to determine the topic mixtures of each document. Graph-based ranking algorithms are a way of deciding the importance of a vertex within a graph, based on the information derived from the entire graph. The basic idea, implemented by a graph-based ranking model, is that of “voting”. When one vertex links to another one, it is basically casting a vote for that other vertex. The higher the number of votes that are cast for a vertex, the higher the importance of the vertex. Moreover, the importance of the vertex casting the vote determines how important the vote itself is, and this information is also taken into account by the ranking model. Hence, the score associated with a vertex is determined based on the votes that are cast for it, and the score of the vertices casting these votes. Identify text units that best define the task at hand, and add them as vertices in the graph. Identify relations that connect such text units, and use these relations to draw edges between vertices in the graph. Edges can be directed or undirected, weighted or unweighted. Iterate the graph-based ranking algorithm until convergence. Sort vertices based on their final score. Use the values attached to each vertex for ranking / selection decisions. This method allows us to obtain relevant keyphrases for each document in the collection. So, in order to obtain relevant topics from the entire collection, we apply the same procedure, where each vertex in the graph denotes relevant keyphrases of the document.